Beavers are relatively docile creatures, staying busy building dams and stockpiling food for the winter. They have a few predators, such as foxes or bears, that beavers can sometimes successfully fight off. But beavers build elaborate shelters that serve as the best protection from creatures looking for a meal. The main form of protection beavers use is building lodges. When a beaver builds a dam, the main purpose is to create a flooded area to hide a lodge. A dam backs up the water into a pond, then the beaver builds a lodge out of mud, sticks, leaves and branches under the water. Lodges are typically cone-shaped, with the top section above the level of the water to allow air to enter the lodge. The dam creates a water barrier between the beavers' house and land predators, who aren't effective hunters in an aquatic environment. 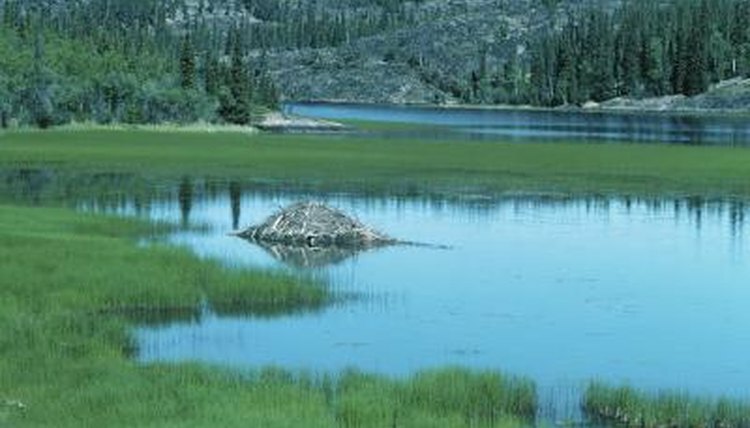 Building lodges in the backed-up water offers protection to the beavers. The lodges usually have more than one exit for fast underwater escapes when necessary. Not all beavers build lodges underwater. Some dig burrows in riverbanks. These dens have underwater entrances just like lodges do, but they are sometimes more vulnerable to attack by predators that can dig through the dirt above the den to get to the beavers. To help protect their dens, beavers tend to build up the top with a mass of branches, leaves and mud. The dried mud hardens to hold the branches in place, which makes it more difficult for predators to dig through, offering extra protection for the beavers. When faced with a threat outside their homes, beavers have a couple of built-in defenses. Their sharp claws that help with digging are also handy with self-defense. Beavers also use their teeth to protect themselves. They prefer not to bite other creatures, and they are unlikely to bite unless threatened by a predator or when they are protecting their territory. Beavers are strong swimmers, but they are somewhat awkward on land. The water offers a quick escape from most predators since beavers' short legs don't allow them to run very well. So beavers tend to stick close to water, whether it's a pond created by a dam or a fast-moving river. They try not to venture too far from the water's edge when foraging for food, such as the inner bark of trees, grasses and leaves. When a threat appears, they can scurry to the water and swim to safety.